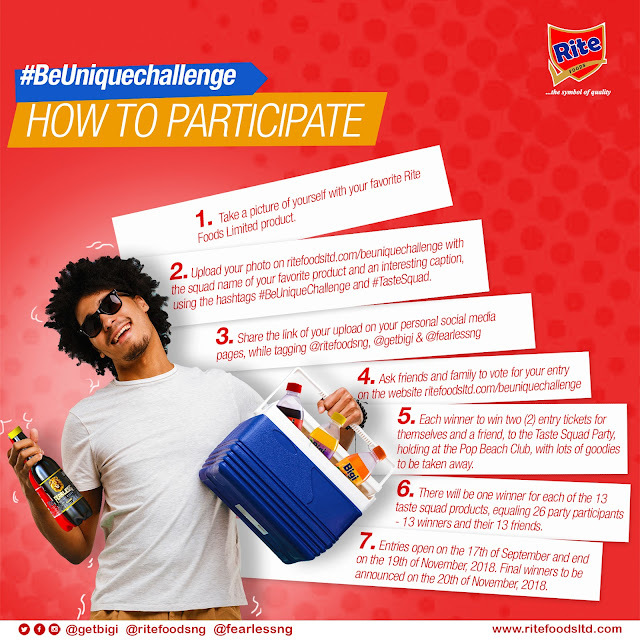 #BeUnique Photo Challenge By Rite Foods Limited!!! The BeUnique Photo Challenge rewards contestants for the highest number of votes on entries with the most creative picture and caption of contestants with their favourite Rite Foods Limited product in view. At the end of this contest, there will be 13 winners representing the 13 members of the Rite Foods’ taste squad. Winners will have the opportunity to nominate a friend to join them @ the X-SQUAD PARTY OF THE YEAR!!! The contest is organized into 13 squad categories and judged by fans’ votes. Contestants are advised to solicit for the votes of their friends and family for the period of the contest. September 17, 2018: Details about the contest will be announced and the contest website is opened for the submission of entries. Voting starts immediately. November 4, 2018: Contest website closes for entries. November 20, 2018: Winners are announced and invited to RSVP for the X- Squad Party of the Year with their one friend selection. November 24, 2018: Winners are invited to attend the 2019 X-Squad Party Show @ Pop Beach for the day. The photographs with the highest number of votes for any of the 13 member squad represented by Rite Foods Limited product by the end of the contest will win the prize. Photos will be reviewed by fans and are reviewed without identifying information. Winners’ selection will be identified by the highest number of votes per squad member. Winners will be contacted using the contact information provided on their entry form. If the winning entrant cannot be contacted within 2 – 3 days of the end of the competition, their prize shall be forfeited and a runner-up photo will be selected by the organizers. By entering this contest, you agree to submit any required personal information and that information may be used in disclosing contest winners on our website and in other publications. Upload a creative picture of you with the product in view and caption creatively using the alias of the product in your picture. Solicit for votes by sharing on any of your social media platforms. Keep sharing until your picture wins the prize. Click on the photograph you want to vote for and click the “love” button after registration. #BeUniqueChallenge photo contest is open to the public except for Rite Foods Limited staff and members of their immediate family. A photo that has been previously published in any manner or entered in any other contest. Entrant submitting more than one photograph. A photo without a product fully in view. A photo that is more than two years old and is less than 2MB. A Photo with more than one person. Photos which include people must depict those individuals in a positive manner. All photos, irrespective of whether or not they contain people must not be obscene, indecent, depict violence or any discrimination or it will be disqualified. The entrant agrees that he/she will not permit the submitted photo to be used by any other entity, without the written consent of Rite Foods Limited. Intellectual Property: By submitting an entry to the contest, entrant certifies that they are the exclusive rights holder of the entry. Where necessary, entrant has acquired all necessary permissions for use or reuse of any part of the entry. Entrant shall indemnify and hold harmless Sponsor for any infringement or other action caused by an entry. Entrant agrees to and acknowledges the completion of the Squad Photo / Video Release. Sponsor shall gain the ownership interest in the entry. Entrant grants Sponsor an irrevocable, worldwide, royalty-free license to use, reproduce, and distribute the entry in all media whether now known or hereinafter created. Notification of Potential Prize Winners: The Winners will be notified by e-mail and phone calls within 1 – 2 days of voting closing to RSVP for the X-Squad Party. If a Winner does not acknowledge acceptance and confirm RSVP within 3 – 4 days of being notified, the runner-up with the next highest number of votes will be contacted and required to respond within 12 hours or the entry ticket will be forfeited all together for those under the squad member. Disputes: EACH ENTRANT AGREES THAT: (1) ANY AND ALL DISPUTES, CLAIMS, AND CAUSES OF ACTION ARISING OUT OF OR IN CONNECTION WITH THIS CONTEST, OR ANY PRIZES AWARDED, SHALL BE RESOLVED INDIVIDUALLY, WITHOUT RESORTING TO ANY FORM OF CLASS ACTION OR PURSUANT TO ARBITRATION. Any Questions you might have can be directed via email to beuniquechallenge@gmail.com.